Hope you guys have had a great start to 2019! We’re starting this new year with an update which adds new stuff and optimizations based on feedback we’ve had recently from you, our community. Hope you guys have had a great start to 2019! It is now possible to move a selected group. It is now possible to assign a selected group to a shortcut. By default this is set to LEFTSHIFT and numbers 5 to 9. You can of course configure this in the options by yourself. When you have a group selected and you click on the lander, the crew member with the lowest health will be sent to the lander for healing first. The possibility of a crew being attacked by an enemy is higher. Crew members won’t jump directly into the lander when they are sent next to it. We’ve reworked the tower enemy prioritization and in this context we’ve also fixed some targeting bugs. Towers are constantly checking for enemy prioritization based on attacking/not attacking, strong/weak and max health/low health – this makes them more effective. We’ve worked on the balancing and the overall “feel” when a rocket tower shoots. The rocket tower feels much more powerful now. In order to reduce the click amount in the game we’ve added additional shortcuts you can set to speed up your base building. It is now possible to select buildings directly by pressing a shortcut. 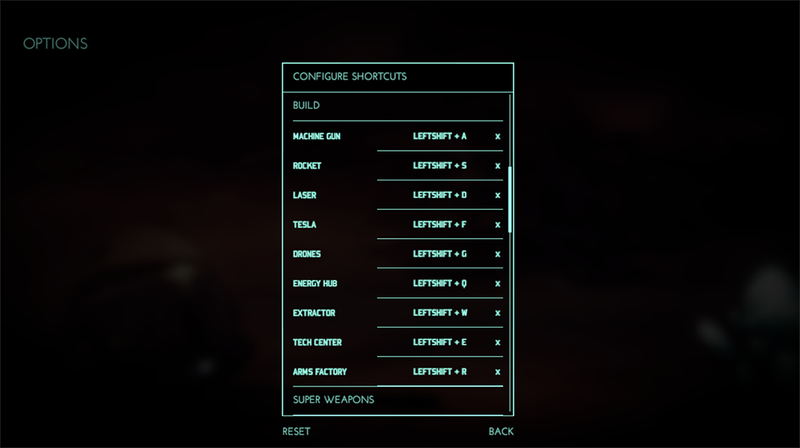 All shortcuts for each building can be set in the options menu. We’ve also added direct ring menu shortcuts which can be pressed as soon as your mouse is over a building. If you wanted to upgrade a building before, you had to click on the building first and then select the upgrade button in the ring menu. Now it’s possible to simply hover over a building, press the direct upgrade command and the building gets upgraded. Please be aware that for compatibility reasons, those shortcuts needs to be set by yourself in the options menu as they are set to none by default. So what’s next you might ask? As we’re working full steam on our full release, we plan to reduce the regular update amount to fully concentrate on the development of the new features. So pretty much like the calm before the storm ;) We will of course keep you all updated on what we’re working on, and what you can expect for the full release. Let us know in the forum if you have any great suggestions and feedback for the game. As always share the news, tell your friends – any support is very much appreciated! Thank you and have fun playing!